Meet AndroidTV: a new TV platform, like the failed Google TV. It's a brand new UI but it's the same SDK as regular Android. Here's what's up: Android TV is a UI that gives you a unified view of your channels. 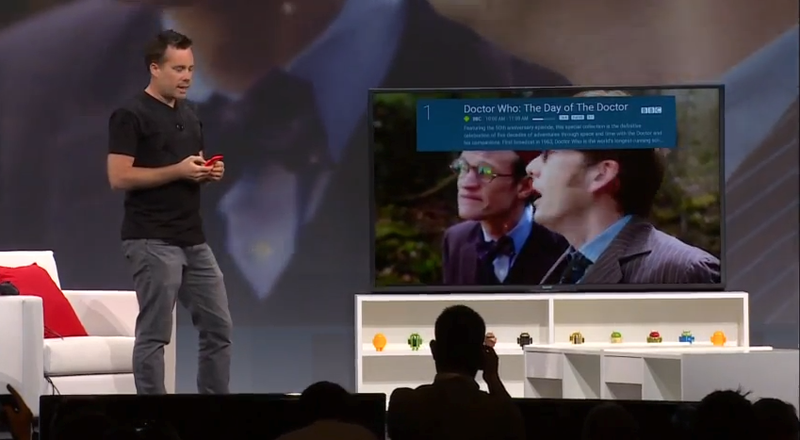 It's a "lean-back" approach to watching TV, says Google. Part of what that means is super simple voice search that works how you talk. For example, you can say "Breaking Bad" and get a full run down of the shows. You could also say something like "Oscar-nominated films from 2002" and get a list there or you can say something like "who played Kevin in Home Alone" and get an answer for that. And it uses the power of Google search you already know and love. While it sounds like an answer to voice search on Fire TV it also seems like it might be better and more specific. Think the power of Google to help you binge watch horrible TV aggressively. Horizontal bars of cards will recommend content, apps, games, etc. The UI is all animated, and it looks pretty fast, as you may expect from Google-powered search. You have a remote, but you don't have to use said remote. If you lose it, you can use your Android Wear watch instead. You'll also have direct access to Google Play, from which you can buy games and play them on your teevee. Already familiar with Chromecast? Great. Android TV includes full Google Cast support, so you can use it in the same way you use your little dongle, sending content directly from your phone or tablet. Android TV will work for TVs, set-top boxes, streaming boxes, and consoles. And at the end of the year, it will come on new televisions from Sony and Sharp. You can also expect products from LG and Razr, which could be set-top boxes, but that remains to be seen. Now, while this is different and seemingly better than Google TV, in that it's integrated with other Android stuff, it's sort of weird that Google is taking yet another stab at a TV platform. Especially considering that Google TV and the non-starter Nexus Q were big 'ol failures. We'll learn more when we actually see Android TV up close and personal.